In a written statement issued November 17, Justice Charles Hackland announced he will waive court costs sought by the City of Ottawa and the condo developer Windmill Development Group against the five individuals who challenged the City’s planning decision to rezone Chaudière and Albert Islands from parkland to commercial/residential, namely from public space to private space. This means that some $66,550 in court costs will not be paid by Douglas Cardinal, Romola Trebilcock, Dan Gagne, Larry McDermott and Richard Jackman. Along with Lindsay Lambert, who was an appellant in the first appeal to the Ontario Municipal Board (OMB), they have spent almost two years challenging the city’s rezoning of the islands at the OMB, and then appealing the OMB’s rebuff of their case. 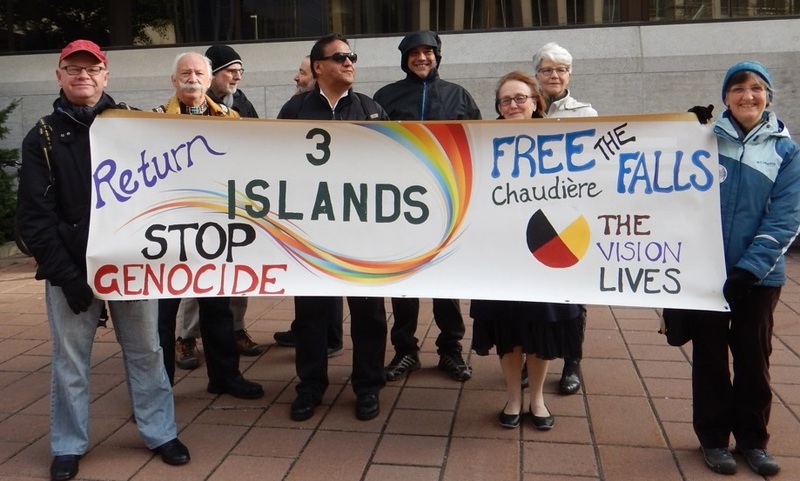 The challenge to the city’s rezoning of the islands in downtown Ottawa in the middle of the Ottawa River was based on the appellants’ view that the islands are a sacred site with deep spiritual significance to the Algonquin people. They attempted to argue that the City’s rezoning in support of a condo development proposed by Windmill Development Group did not take into account the constitutional rights and legitimate concerns of indigenous people. “I also feel strongly that all the legal challenges to date have not allowed me to elaborate on the reasons for endorsing Elder Commanda’s vision for the site,” she added, referring to the fact that the case at the OMB only reached the pre-hearing phase. The appellants launched subsequent appeals because they felt that the pre-hearing by the OMB, which lasted 2 days in August 2015, did not give them a chance to outline their arguments against the City of Ottawa’s rezoning of the islands. The most recent rejection of their appeals came on October 26—a case for which costs have not yet been assessed. Justice Hackland notes in his statement that the City of Ottawa and Windmill Development Group have “a clearly superior capacity to bear the costs” linked to the court proceedings. Read the full ruling on Scribd.